How do you turn off or toggle the mouse so that it does not broad cast to all clients? You might want to turn off Broadcasting altogether, which you can do with SHIFT+ALT+R or use the broadcasting toggle button. Which is the Right button of the two. There is also this bit of handy info. I only want the mouse repeater to be either perma off or toggled off. I want all keys to be broadcast just not the mouse1 and mouse 2 buttons (i.e. the movement is driving me crazy) please respond with how to turn off the mouse braodcast. I've read through the post and I could not find how to turn off mouse broadcast. We have to make sure, because that is not the normal method, and will generally annoyances to most people. So you can toggle mouse repeat, and also toggle key repeat independently, you need to do the following. 1. Under ISB42 - Toggles, Activate Repeat (current Window), in Step 1, you will need to select the second action, and UNTICK the mouse repeat. 2. Under ISB42 - Toggles, Activate Repeat (current Window), in Step 2, you will need to select the first action, and UNTICK the mouse repeat. 3. 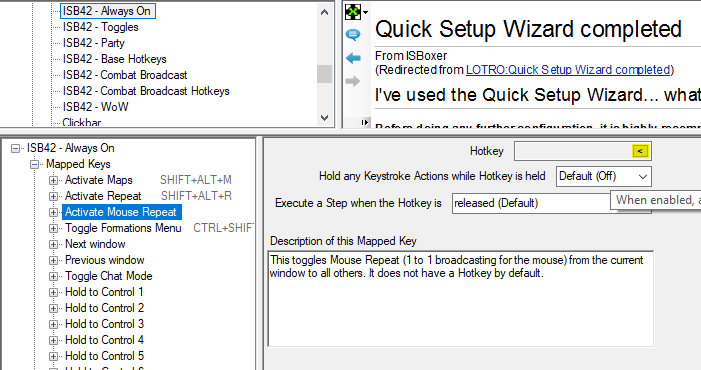 In ISB42 - Always On, select the Activate Mouse Repeat mapped key, and set a Hotkey on it.